I already know this is going to be one of my favorite apps and I have only been using it for a little while! 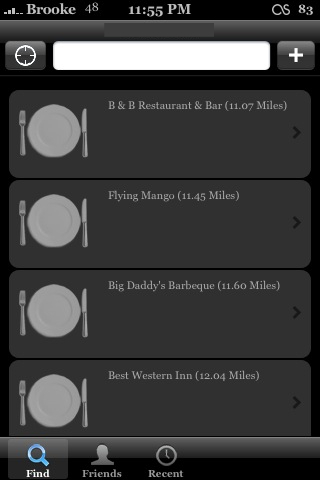 StreetFlow is an app that locates dinning establishments based on your location. 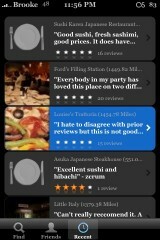 It also includes a rating of the restaurant and comments from others who have been to the restaurant. 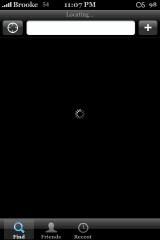 When you open the app, it will take a few seconds to find your location. It will then display a list of restaurants starting with the one closest to you. 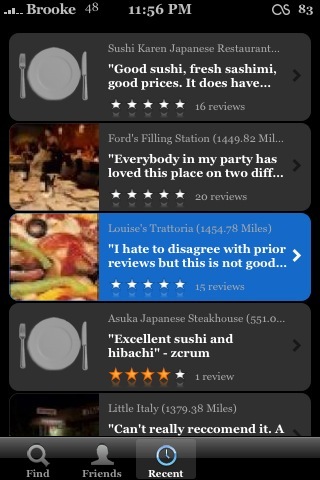 From the list, you can tap on a restaurant to get more information like; the name of the restaurant, the address of the restaurant, it’s rating (based on a five star rating system), a list of comments and the ability to add a comment. If you would like to add a comment, just tap the plus icon in the upper right corner. 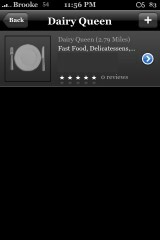 You can then enter your comment, attach a photo to the comment and rate the restaurant. If you would like to call the establishment or see where it is located via Google Maps…just tap on the blue arrow next to the name of the establishment. You can also tap on a comment to see the entire comment or to mark it as inappropriate. 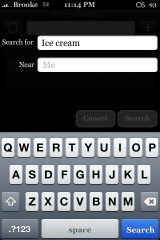 The feature that I look forward to using is the Search feature. If you tap on the white search bar, you can then type in what you would like to search for and it will bring up the most relevant restaurant based on your location. If you notice the a restaurant you really enjoy is not on the list, you can easily add it to the list by tapping on the plus icon in the upper right corner. 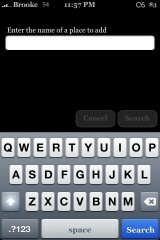 There are also two option on the lower menu bar; Friends and Recent. Honestly, I’m not exactly sure what friends are or how to add them! But, the recent options is very cool. It will show you the ten most recent entries added to the app…no matter where they are! So far, this app seems to be working great. 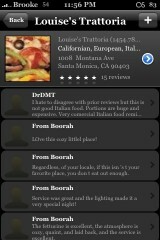 People are leaving honest feedback and even giving suggestions on what to order at a particular restaurant. 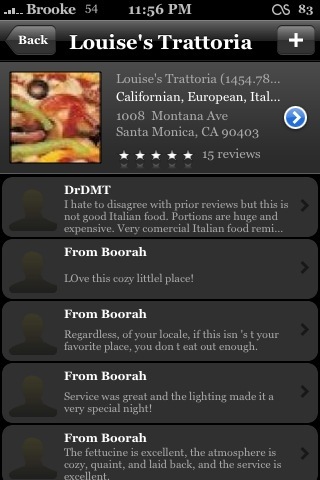 You must be registered with the app to add a comment and/or add a restaurant. It uses the same User ID as Wallpaper and Collage. If you do not have a User ID already set-up you will need to do it through this app, it will prompt you when you tap on the plus icon. I think this is going to be a great little app! 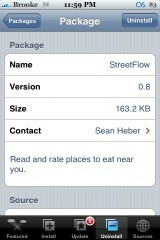 StreetFlow is available through the iApp-a-Day source. The restaurants database is fetched from google maps database? Or from where? Eh, I see no problem with the YellowPages web app… I mean that’s what web apps are for. 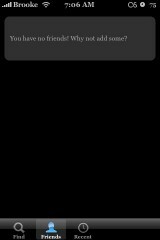 you can stop sms pop up with caterpillar. Where does it take the reviews from ? I just added a restaurant and missed where I need to fill in the address and phone. Does this work on ipod touch? with location via wifi? How do I add the phone and the address? 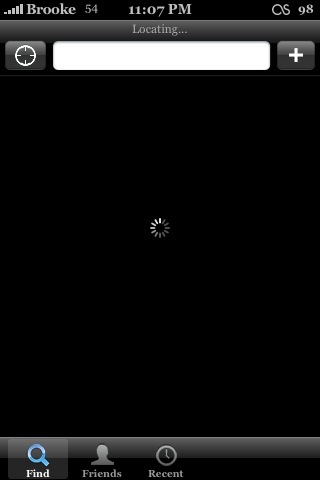 it doesn’t appear to work on my iPod touch. I guess there are no people around here in Daphne Alabama that are smart enough to operate, let alone jailbreak the iphone to use this program. I like it and will keep it, but I guess I have alot of eating out to do so I can get this place on the map. 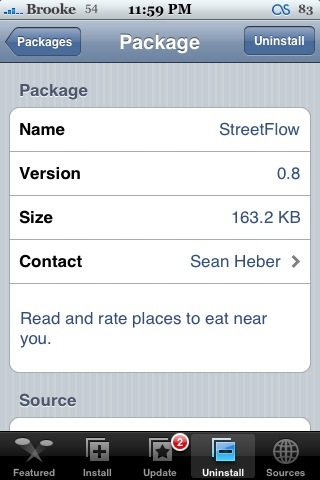 I guess I could be a “Streetflow” food critic for the area, now if I could only get paid to do it. In other words there are no entries when I open the app. Does it only work in th us? 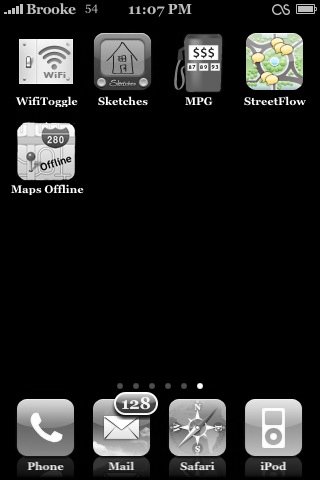 I cannot find the app to download to my iphone.. anyone help me out with this? It gets SO tiring to create login/pw for each application, website, web-app, etc. Someone save us from this monkey business! I loved when you could just use these things w/out logins!!! what about the locate friends feature?? Looking for a tip on how to edit the location I just created. Didnt`t create a phone number and adress. And how can I change my “rating”? Great application! 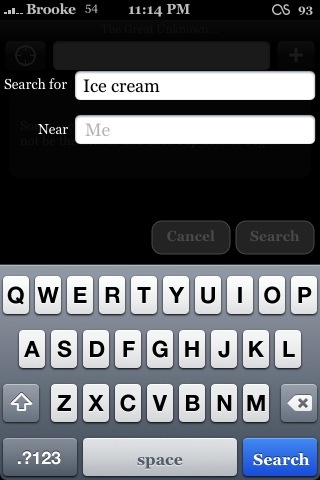 And if you have no friends, you can just use it as a list to remember your best restaurants! Editing your entries need to added in this sofware, or at least some website where you could change your information. Also I just found out that you are not able to put some reviews for restaurants outside of the area you are when adding a comment. I’m living in Antwerp, added a review for a restaurant in Paris, but the application stores it as a restaurant near Antwerp. Also a tutorial should be available. I did not found out yet where to put the telephone and street address. agreed, definately need to be able to edit your own posts on street flow, great little idea with alot of potential but not being able to edit or add a photo later / or from camera roll is very frustrating! works up here in Canada too…just fine! dunno how a real estate agent got “in” but hey, I’m not selling the house anyways! the application also seems to be unable to grab my location consistently, always placing me into, “the great unknown..”, and when i write a review in, “the great unknown..”, i should be able to place it in the correct area, but alas, this is yet a feature to be added in hopefully upcoming versions of this great little application. I was wondering where the information is being pulled so I monitored the traffic from my iPhone and found that it connects to 66.135.60.81 (gogoapps.com) and servers related to 72.21.207.137. Anyone know anything about them? I couldn’t add the source to download/install it… the guy seems left the company… any idea? thanks. I am very happy I found your website on google. Thanks for the sensible critique. Me and my boyfriend were just preparing to do some research about this. I am glad to see such great information being shared freely out there.